As the world fails to come to an agreement on how to tackle climate change, there are cycling solutions that can be implemented right now, explains ECF President Manfred Neun. If there’s one message I’d like to leave with politicians this year, it’s that cycling is a powerful tool that provides solutions now. Not tomorrow, not in twenty years time, but now. When it comes to solutions to climate change, cycling excels. Hedegaard is right. We need to act quickly. While we wait for a global agreement, the EU is demanding to slash EU emissions by 80% by 2050, and a 60% cut in transport emissions. Here’s where things become worrying. The transport sector is not clean at all. In fact, the opposite is true. While emissions in other sectors have decreased between 1990 and 2007, the transport sector saw its emissions increase by 36% in the same period, accounting for around one quarter of all EU emissions. While meeting the EU global reduction target is a real challenge, meeting the EU transport target is an even bigger one. When Italy held its first national cycling conference in Milan, I stressed the following point: cyclists don’t need the climate debate, but the the climate debate needs a lot more people cycling. Why? Because technology is not going to save the day. Most if not all projections and scenarios conclude that improvements in vehicles and fuels will not allow us to achieve targets. We’re going to have to change the way we move , and cycling can and should represent an important part of this shift. ECF’s CO2 Study which investigates the potential of cycling to achieve EU targets. What governments need to understand is that cycling can be a powerful tool in cleaning up the transport sector. It’s cost efficient, it’s relatively cheap and easy to implement, and best of all it has solutions that exist today. 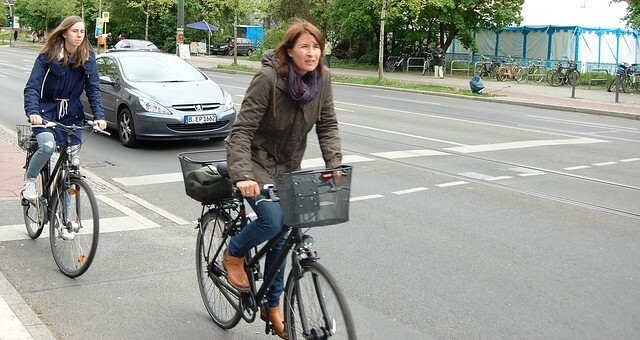 If every person in the EU cycled as much as the Danes – an average of 2.6km a day – it would help the EU meet more than a quarter of the targeted emission reductions for the transport sector. We should not underestimate the power of cycling to green transport. And cycling is not only good for the climate change. It is quite obvious that investments of public money in cycling provide a very fast return on investment. Ample evidence of this has been given in the past five years during the various Velo-city conferences. The benefits of cycling are huge in many respects (see for example the Charter of Seville). Cycling is without a doubt growing. Europe’s most populous nation, Germany, now sees almost 15% of all trips done by bicycle, an increase of more than 60% in 10 years. Other countries are seeing similar increases. Cycling advocacy is seeing many successes in cities, regional and national authorities; but we are also quarreling with decisions makers not paying enough attention to this issue. We are moving in the right direction, but undoubtedly way too slow. It’s now time that we recognize cycling. I’m calling on European Commissioners like Connie Hedegaard, and Siim Kallas (Transport Commissioner) to make use of cycling as a tool, and ensure they are included in strategic documents. And I’m also calling upon them to invest resources. People will not cycle if they do not feel safe and to feel safe they need adequate infrastructure. European and national subsidies could go a long way. Budgets are now being decided, with the planning of the next financial period (2014 – 2020) already underway. Cycling must be integrated into the relevant national and regional strategies and programs and given adequate resources to improve the conditions for cyclists. ECF has identified €6 billion worth of European Union funding to be used on cycling and cycling-related initiatives throughout Europe. This is Europe’s chance to make a big difference. And by getting more people cycling, we’re going to see benefits elsewhere, whether it be economic growth, improved public health, or global justice. Let’s not underestimate cycling. It’s a powerful solution which exists today. Time for the world’s leaders to make the most of it.